First-year law student Chakeria Gilbert spent the last day of her orientation at Samford University’s Cumberland School of Law painting a bedroom. She was among more than 100 students taking part in the law school’s annual “First-Year Service Project" Aug. 14. For this year’s service day, Cumberland School of Law first-year students, faculty and staff volunteered at Turkey Creek Nature Preserve, Ronald McDonald House, Easter Seals of Alabama, Pathways Women’s Shelter, Grace House Ministries, Red Mountain Park and Children’s Village. Established in fall 2007, the First-Year Service Project is now a tradition during first-year student orientation at Cumberland School of Law. To conclude a week of traditional orientation events, the first-year class embarks on a group service project on the last day of orientation. 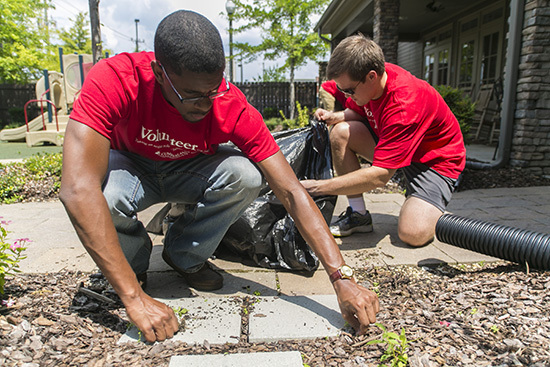 The first-year class, faculty and staff provide hundreds of volunteer hours in one afternoon to community service projects at various locations around the Birmingham area such as nature preserves, state parks, local ministries and nonprofit organizations. The First-Year Service Project fits with the law school’s pursuit to engage students in community-based volunteer efforts. It also provides new students with an opportunity for community outreach in a city that is new to most of them and gives new classmates a chance to interact outside of the classroom. The service project got underway as students gathered for breakfast at Rosewood Hall in Homewood’s downtown SoHo district to hear from Adams, Cumberland School of Law Dean Henry C. “Corky” Strickland and several second- and third-year law students before heading out to their respective service locations around town. Through its Public Interest Program, Cumberland School of Law offers many legal and non-legal public interest and pro bono volunteer opportunities for students. In addition to the First-Year Service Project, students can participate in the Help the Homeless Program, Pro Bono Week, Project Homeless Connect, Cumberland’s Community Mediation Center and Public Interest Fellowships, among many other activities sponsored by Cumberland’s student-led Public Interest and Community Service Organization throughout the year.